WATCH: Horizon Zero Dawn Development Video | Nerd Much? A new Horizon Zero Dawn development video has been released today. The video explains how Guerilla Games developed the designs of the machines. 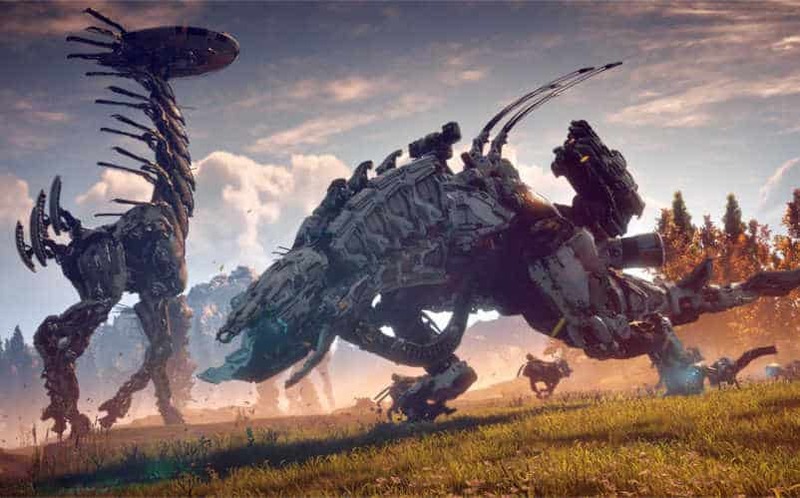 As the Horizon Zero Dawn development video reveals, the animal resemblance of the robots provides the player with an idea of how they might react to a given situation. For example, the team studied fiddler crabs and pistol shrimp while designing the crab-like Shellwalkers. They focused on how the animals gather food, carry their shells, and fend off predators. By really fine-tuning the creature’s design, they create something that looks new, but feels familiar at the same time. Later in the Horizon Zero Dawn development video, we see a new creature in the form of a Snapmaw. These machines resemble a giant crocodile. As you might guess, these are water-based machines that move at a great speed. Get them on land though, and you notice how much slower they move. Still, their large jaws and powerful tail will put up a significant fight. The more we see of Horizon Zero Dawn, the more we want to jump right in. We were already sold on the concept of robot dinosaurs. With February 28 getting closer and closer, we are glad to see that so much work is being put into perfecting this open world game.